Last evening we went out thinking we will take an auto and go to the market street of Yercaud. The one auto that stopped said he was on “water” duty so could not take us, and the person across the road with an Ambassador car came and offered to take us. What a good decision that was ! The driver was a nice person and a genuine guy who told us truthfully not to go to the Killiyur falls as there was no water there :). 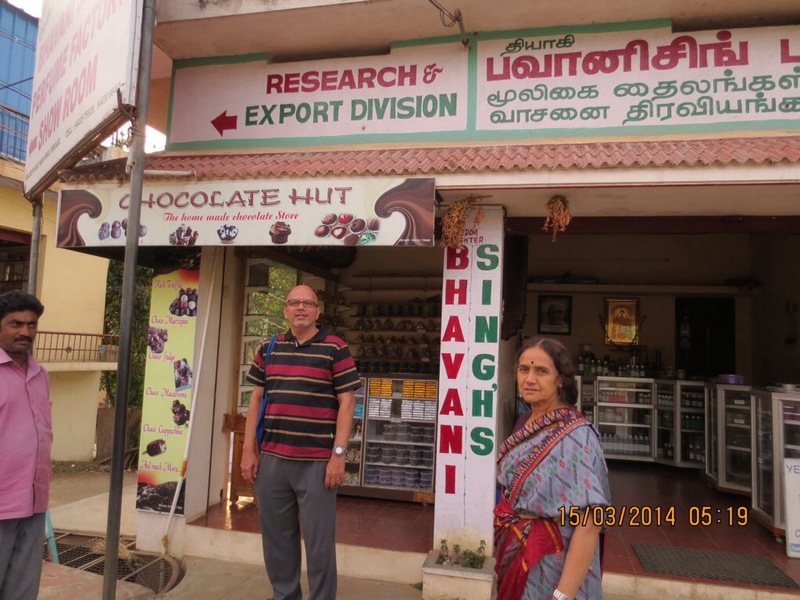 He took us to Bhavani Singh Perfumery to buy honey and as soon as we walked in, I remembered the shop … We had bought some eucalyptus oil from them in 1993. The shop has been setup by a freedom fighter and has awesome natural products. They were inside a park, in 1993 and now are at a place called Ladies point. This shop is hugely recommended – the honey is natural and the pain relief, sinus relief oils are awesome, all natural and very effective. They have an adjoining chocolate shop which sells homemade chocolates. We then got back and took a walk around the lake. Ate the mirchi bhajji in the evening … It is just bhajji and there is no spice :(. Why do people run from spicy food ? Hey, you lose weight by eating spicy food …. Hahahahaha my lame attempt at getting the young to eat spicy food. Spice that comes from green chillies and peppers, not the dry spice. Today morning we went for breakfast and morning coffee to Sri Saravana Bhavan Elite and I have to say, even the towel they hang in the wash room is clean. I was taught by Satya Dev long long back never to wipe my hands in the hotel towel as it is filthy, so I never do, except in this hotel :). We got talking to a manager there and got a free lesson in market entry strategy with penetrative pricing. This restaurant chain has eight branches in Salem, the owner is from Tirunelveli district and they offer coffee at Rs. 10 between 6.30 am to 8.30 am in Yercaud and 5 am to 7 am in Salem and then the coffee price is Rs. 25/- for the rest of the day. Am sure the owner didn’t do an MBA in marketing but applied his common sense to figure out that good, morning coffee at Rs. 10 will get the crowds in and they may choose to eat something else as well. Hmmm Prof Krishnamurthy has some competition :). I then commented about the cleanliness in the hotel and was told that the owner picks up even a small piece of paper or dirt from the floor during his rounds and insists on keeping the place spotless. Talk of walking the talk. And this is one owner-leader who regularly visits his restaurants without notice… So my mother commented, “he must be wanting to check if things are going well and so must be doing a surprise visit” and pat came the reply, “not at all, we actually look forward to his visit and miss him if he doesn’t come” … Engagement score is pushing the best employer range :):) Good lessons early in the morning. Fortified with coffee … Ok yes, I did give them suggestions for better coffee, want the consistency that comes when we mix their current “double strong” and “regular” coffees. Sorry, can’t stop being a “nonavattam” – “nitpicker” in English. 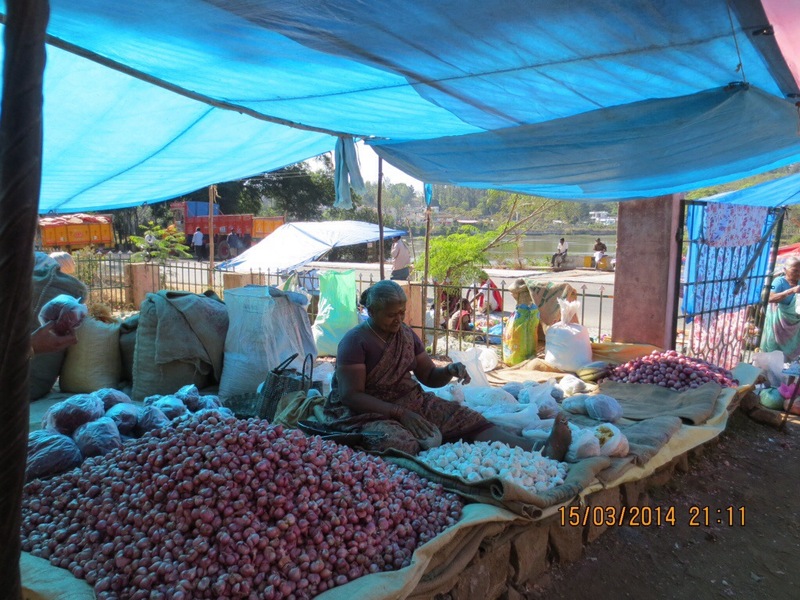 So, fortified with coffee and Idlis, we started our walk around the lake and saw there was a weekend market being setup. 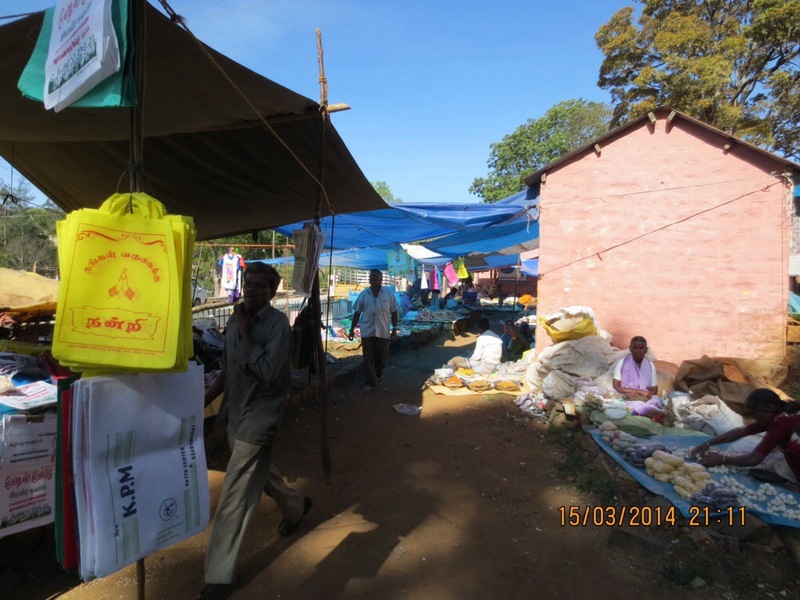 Bought vegetables and jaggery and my woven plastic bags. Felt so nice to walk around the old style market complete with “killi Josiam” (parrot astrology) and the colorful plastic boxes. 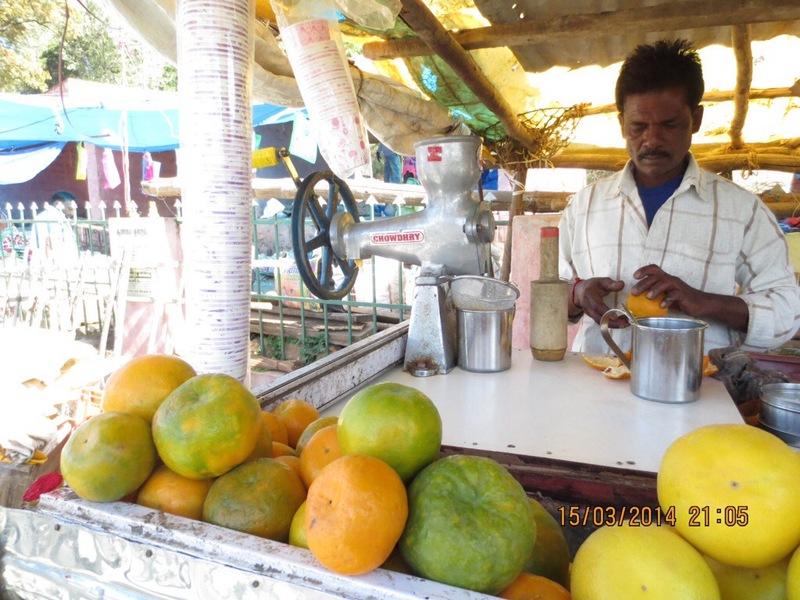 We also had the sweet lime and orange juice without sugar and ice and that pleased the vendor no end, because he commented on how most people insist on heaps of sugar and loads of ice. One suggestion for the state of TamilNadu – please ban the horns that trucks, buses, cars and bikes have. They are loud enough to physically move “me” and puncture my ear drum, damaging my hearing permanently. Thanks Roji. Should post some more pics shortly. Great site! Brought back memories of my recent trip to Yercaud. By any chance would you be having the phone number of this chocolate shop. I want to place some order. Thanks Dr. Roy. 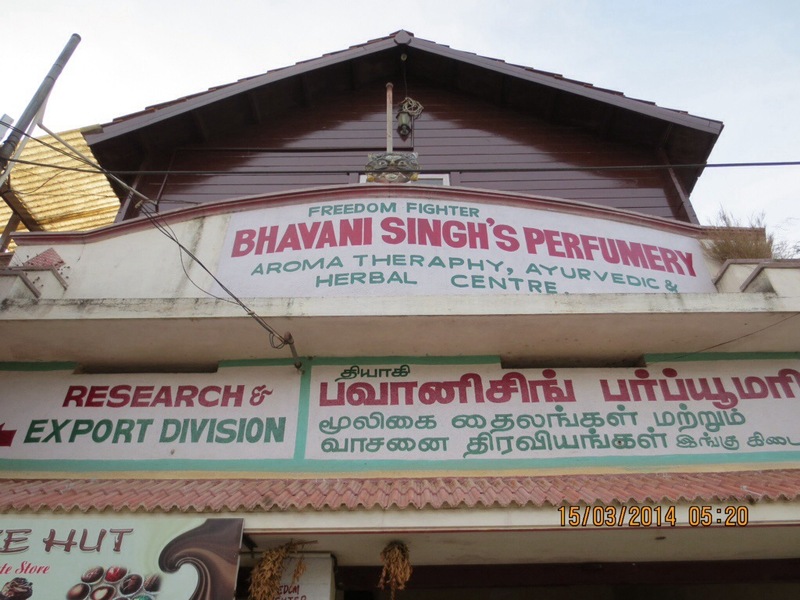 Bhavani Singh has a website – http://www.bhavanisinghsperfumery.com/home.html. That’s got their contact number.